In each of the Primary classes we will meet about 25-30 children working with two adults. In these schools, both adults in each class are trained in the Montessori approach and work together as a team. Some schools prefer to staff their classes with one certified teacher and one or more assistants. To become a Montessori "Guide" or "Directress" as they are called in some schools, the teachers went through a demanding course of graduate level study. Each classroom is fairly spacious compared to what we usually find in traditional nursery schools. It is clear that someone took great pains in designing the space, selecting the furnishings and creating an atmosphere of simple beauty. Several things stand out as being different from the typical classroom for young children. There are no blackboards at the front of the room. There are no posters of cartoon-like animals, no cardboard alphabet hung on the walls, or the familiar collection of dozens of identical art projects. Instead the classroom is divided into several logical areas by low open shelves, on which we see displayed an array of lovely and intriguing learning activities. We may not know what they are called, what they do or why they are used, but they draw our attention and make most adults visiting a Montessori class long to be a child once again. Although it may not be immediately obvious, there is an order to the room and a careful structure of how things are arranged. The teachers will tell you that their environment is divided up into several areas: one for Practical Life, one for Sensorial, one for Language, another one for Math and probably somewhat smaller areas for Art, Music, Geography and Science. History at the Primary level includes a fascinating series of exercises and activities to introduce a young child to the concepts of time and the early stories of how the Earth was created and how life and eventually people evolved on it. The exercises on each shelf are arranged in a highly logical order. They are placed in the room according to their logical category such as Practical Life or Mathematics; any logical sub-grouping, such as pouring or fraction work; from the most simple idea to the most complex; and from the most concrete way of representing each concept to the most abstract. According to this scheme, materials are displayed on the shelves from the top-left corner to the right side, down a shelf and moving again from left to right, until we come to the lower-right corner. Each material isolates one concept or skill. Each has been designed so well that it "calls to the child", or more clearly said, it is so beautifully designed, that the children naturally want to work with it with little or no nudging from adults. Each material has also been designed so that a child can check his own work; we call this a built in "control of error". The intention of the materials is not to keep the children dependent on these artificial learning aids forever, but to use them as a tool to help children be able to work and learn at their own pace, to see abstract ideas presented in a very concrete three-dimensional way and to help them to understand. The children normally come to school for five days a week. Most Montessori schools do not offer two- or three-day programs, because young children are incredibly responsive to consistency and order in their environment. When a child comes to school only a few days a week, he never attains that consistency and order. In some schools, two three and four year olds go home at noon, while in many others they stay for the full day. Dr. Montessori's research let her to conclude, that intelligence is not rare among human beings. It manifests itself in the natural, spontaneous curiosity of the young child from birth. Montessori observed that when children grow up in an environment that is intellectually and artistically alive, warm and encouraging, they will spontaneously ask questions, investigate, create and explore new ideas. She found that children, especially when they are young, are capable of absorbing information, concepts, and skills from their surroundings and peers almost through osmosis. Dr. Montessori argued that learning can and should be relaxed, comfortable natural process. The secret is to pay attention to the hidden nature of the child at a given stage of development and to design an environment at home and school in which they will begin to fulfill their innate human potential. Montessori as an educational approach is not designed simply to teach children basic skills and information. In addition to becoming culturally literate, children need to learn to trust their own ability to think and solve problems independently. Montessori encourages students to their own research, analyze what they have found and come to their own conclusions. The goal is to lead students to think for themselves and become actively engaged in the learning process. Rather than give the students the right answers, Montessori teachers tend to ask the right questions and lead students to discover the answers for themselves. Learning becomes its own reward and each success fuels a desire to discover even more. Dr. Montessori found that at every age level, students learn in different ways at different rates. Many learn much more effectively form direct hands-on experience than from studying a textbook or listening to a teacher's explanations. But all students respond to careful coaching with plenty of time to practice and apply new skills and knowledge. Like the rest of us, children tend to learn through trial, error and discovery. Montessori students learn not to be afraid of making mistakes. They quickly find that few things in life come easily and they can try again without fear of embarrassment. Geography The Earth, Study of the Globe, Continents, Land and Water Formations, Oceans and Zones. The Montessori curriculum is organized as an inclined spiral plane of integrated studies rather than traditional model in which the curriculum is compartmentalized into separate subjects with topics considered only once at a grade level. Lessons are introduced simply and concretely in the early years and are reintroduced several times over the following years at increasing degrees of abstraction and complexity. The Montessori course of study is an integrated thematic approach that ties the separate disciplines of the physical universe, the world of nature and the human experience. Literature, the arts, history, social issues, civics, economics, science and the sturdy of technology all complement each other in the Montessori curriculum. This integrated approach is one of Montessori's great strengths. As an example, when Elementary Montessori students study Africa, they look at the physical geography, the climate, ecology, natural resources and the ways in which people have adapted to their environment: food, shelter, transportation, clothing, family life and traditional cultures. The might read African folk tales, study great African civilizations and endangered species, create African masks and traditional instruments and make African block print T-shirts in art, learn some Swahili, study dance and music and prepare some typical meals from various African cultures. Guest speakers, performers and friends of the school help to make the curriculum come alive through their memories, talents and personal experience. Success in school is directly tied to the degree to which children believe that they are capable and independent human beings. If they knew the words, even very young children would ask: Help me learn to do it for myself. As we allow students to develop a meaningful degree of independence and self-discipline, we also set a pattern for a lifetime of good work habits and a sense of responsibility. In Montessori, students are taught to take pride in their work. Independence does not come automatically as we grow older; it must be learned. 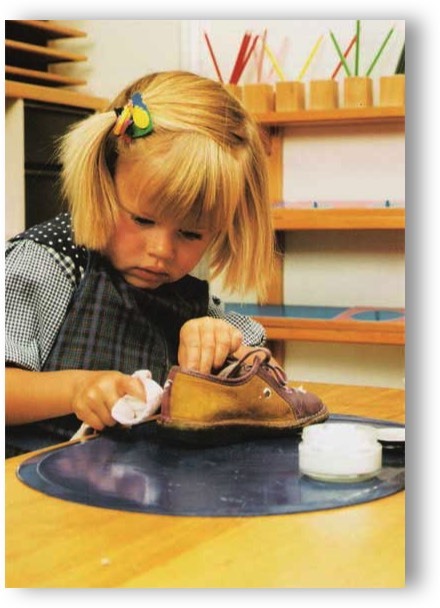 In Montessori even very small children can learn how to tie their own shoes and pour their own milk. At first shoelaces turn into knots and milk ends up on the floor. However, with practice, skills are mastered and the young child beams with pride. To experience this kind of success at such an early age builds a self-image as a successful person and leads the child to approach the next task with confidence. Working with nature, both in and out of the classroom helps Montessori students integrate conceptual science with practical-life skills. Students of all ages experience the excitement of watching their seedlings develop into beautiful flowers for a floral arrangement to decorate their classroom with edible vegetables to prepare for a midmorning snack. In a very real sense, Montessori children are responsible for the care of this child size environment, which is why Dr. Montessori called it a "Children's House" or "Community". They sweep, dust and wash mirrors and windows. They set tables, polish silver and steadily grow in their self-confidence and independence. The lessons in practical-life skills do much more than help children learn to wash tables. The process helps them develop an inner sense of order, a greater sense of independence and a higher ability to concentrate and follow a complex sequence of steps. As they get older, Montessori students learn all sorts of everyday living skills, such as using computers, household cleaning, cooking, sewing, first aid and balancing a checkbook. They plan parties, learn how to decorate a room, arrange flowers, garden and do simple household repairs. Montessori builds many opportunities into the curriculum for students to gain hands-on experience. Learning how to work and play together with others in a peaceful and caring community is perhaps the most critical life skill that Montessori teaches. Montessori schools are intended to be close knit communities of people living and learning together in an atmosphere of warmth, safety, kindness and mutual respect. Teachers become mentors and friends. Students learn to value the different backgrounds and interests of their classmates. A child interacts with the physical world through his senses. From birth, he will look, listen, touch, taste, pick up, manipulate and smell almost anything that comes into her grasp. At first, everything goes into the mouth. Gradually he begins to explore each object's weight, texture, and temperature. He may watch something that catches his attention, such as a butterfly, with infinite patience. The Sensorial curriculum is designed to help the child focus his attention more carefully on the physical world, exploring with each of his senses the subtle variations in the properties of objects. At first, the child may simply be asked to sort among a prepared series of objects that vary by only one aspect, such as height, length or width. Others challenge him to find identical pairs or focus on very different physical properties, such as aroma, taste, weight, shades of color, temperature or sound. These exercises are essentially puzzles and they tend to fascinate the children because they are just difficult enough to represent a meaningful challenge. Each has a built-in control of error that allows the child who is observant to check his own work. All the Sensorial exercises are essentially lessons in vocabulary, as the children master the names of everything from sophisticated plane and geometric figures to the parts of familiar plants and animals. As the Eskimos demonstrate to us with 26 different words the snow, we observe that as the children learn the correct names for things, the objects themselves take on meaning and reality as the child learns to recognize and name them. Why is it so important to educate the young child's senses? We certainly don't believe that we can improve a child's hearing or sight through training. However, we can help children pay attention, to focus their awareness and to learn how to observe and consider what comes into their experience. In a way, the Sensorial curriculum accomplishes something like a course in wine tasting or music appreciation; one learns to taste, smell or hear what is experienced with a much deeper awareness and appreciation. These exercises can help the children learn and appreciate their world more fully. The Pink Tower is one of the Sensorial materials that children enjoy working with early in their Montessori experience. The Pink Tower is composed of a graduated series of 10 wooden cubes. The largest cube has a square section of 10 centimeters per side and is 10 centimeters high. Thus, it measures 10 x 10 x 10 centimeters. The square section and height of the succeeding cubes decreases by one centimeter down to the smallest cube which measures 1 x 1 x 1 centimeter. Children carefully carry the tower, cube by cube, to the little rug that defines their work area. They carry each cube comfortably at waist height as they take the cubes and place them in random order upon the rug. As they manipulate the cubes and carry them across the room, the children get a very strong impression of size and weight. When all the cubes have been carried to the rug, the child looks for the largest one and begins to build the tower, one cube at a time. At each step, the child looks through the cubes that have not yet been added to the Tower to find the largest. As each is placed on the tower, the child controls his movements to place the cube gently down right in the center of the larger cube on which is rested. Once the tower has been constructed, the child carefully takes it down and either begins again or returns the cubes, one by one, to their little shelf. All of the Sensorial materials also lead into vocabulary lessons and language. For example the child working with the Pink Tower masters the terms smaller, smallest, larger and largest. The Brown Stairs, which is sometimes called the Broad Stairs, is made up of 10 rectangular prisms with bases that have exactly the same graduated measurements as the cubes of the Pink Tower, but which are uniformly 20 centimeters long. The child is challenged to scatter them on the rug and sort them by size to place all 10 prisms in proper order from thickest to thinnest. This results in a graduated series of rectangular prisms that resembles a little stairway. Because the squared sides of each prism correspond to the dimensions of the cubes of the Pink Tower, the two materials are sometimes used together for all sorts of explorations and designs. Some people have heard, that in Montessori the children are taught there is only one way to work with each material. In truth, the children explore and discover all sorts of creative work with them. For example, they will construct the Tower horizontally or line up two edges to create a vertical stairway. The children will also build the Pink Tower in various combinations with the Brown Stairs along with some of the other Sensorial materials. The Red Rods are a series of 10 rods (thin rectangular prisms) in which the height and width are uniform, but which range in length from one decimeter (10 centimeters) to a full meter (10 decimeters or 100 centimeters). The child scatters them on the rug and looks for the longest. As each in turn is arranged along side of the other in a series, they help the child discover the regular progression of length. The teachers introduce vocabulary: short, shortest, long, longer, longest. The Red Rods are quite similar to the Red and Blue Rods in the Math area, which help the child learn to count by showing the growth of quantity as length, distinguished by alternating patterns of red and blue to represent each decimeter. The Cylinder Blocks are a set of four naturally finished (unpainted) rectangular blocks of wood, into which have been cut 10 cylindrical holes. Each hole is filled with a matching wooden inset fitted with a little knob on the top to make it easy for a child's small hand to grasp and lift the inset out of its perfectly fitted hole. Each set of cylinders is constructed to vary in a regular sequence by either diameter, depth or both. The children remove each cylinder in turn, carefully placing it in order on the table. Once all 10 cylinders have been removed and placed on the table, the children take each in turn and find the hole into which it fits perfectly with the tip of the cylinder flush with the top of the cylinder block. If they've made a mistake, the children can normally see it for themselves because all 10 cylinders will not fit correctly. The children quickly begin to challenge themselves by attempting to "see" which hole is likely to fit the cylinder in their hand rather than trying to fit each into one hole after the other. After a while, they will begin to do the same exercise with their eyes blindfolded, relying on touch alone. When they are ready for a great challenge, the children will mix the cylinders from two, three or all four blocks together and try to fit them into the corresponding holes. The Knobless Cylinders correspond to the four Cylinder Blocks. In this material, the set of each cylinder is painted red, yellow, blue or green. With no cylindrical holes, the children depend upon width or touch alone to arrange the cylinders. They will often work with both, the Knobless Cylinders and the more familiar Knobbed Cylinders from the Cylinder Blocks together, finding the match between each brightly painted and unpainted cylinder in turn. By working all four sets of Knobless Cylinders together, the children discover all sorts of geometric patterns and progressions within the material. The Color Tablets help the child learn to distinguish among primary and secondary colors and tones, while mastering the words used to describe each color and shade. There are three separate boxes of Color Tablets. All of the tablets have the same shape and differ only in color. The first box of Color Tablets contains six tablets, two each of yellow, red and blue. The children simply match the pairs and learn the spoken names of the colors. The second box of Color Tablets contains eleven pairs of secondary colors and tones, which the children match and name. bring back the tablet that is just one shade lighter or darker. Touch - the children commonly put on blindfolds to add an additional level of challenge as they sort or construct with the Sensorial materials. They love to explore their sense of touch. One of the children's favorite activities is the Mystery Bag. Normally it is simply a cloth bag or box with a hole for their hands in which they touch and manipulate objects that they cannot see. One activity is to place things that are familiar to the children inside, and challenge them to identify them by touch alone. Another exercise begins with the Rough and Smooth Boards, which have a surface that alternates between the roughness of sandpaper and a smooth finished surface. The children wash their hands in warm water before beginning to make them more sensitive. The Sandpaper Tablets are a set of wooden tablets covered with several different grades of sandpaper. The challenge is to identify pairs that have the same degree of roughness, working by touch alone. An extension of these activities is commonly created by assembling a collection or pairs of cloth swatches cut from many different materials, each with its own texture. Again, working with eyes blindfolded, the children attempt to find the pairs by touch. Like all Montessori exercises, there is a built-in control of error. In this case the children can check their work by removing the blindfold and seeing if the pairs look the same. The Thermic Tablets - the thermic sense is the ability to distinguish among objects with different temperatures. The Thermic Tablets are a series of pairs of objects of identical size that are made from different material such as wood, stone and metal. The material tends to feel quite differently from each other at room temperature when lightly touched by a blindfolded child. The challenge is to match them by temperature. The language of temperature is also taught: hot, cold, hotter, hottest, warm, warmer, warmest, cool, cooler, coolest etc. The Baric Tablets - the baric sense is the ability to distinguish among different objects by weight. The Baric Tablets come as a box containing three sets of little wooden tablets, identical in size, but made out of three different woods. One wood is very light; the next is made of a heavier material and the third quite heavy for its size. The child puts on a blindfold and sorts among the scattered tablets to find identical pairs or to determine which in any given set of two is lighter or heavier. The Smelling Bottles resemble small spice containers with lids that have small holes through which the material inside can be smelled but not seen. The teacher prepares a set of six pairs. One set of six typically has red caps, the other has blue. The child is challenged to find the identical pairs. Gradually the child learns to identify the source of the aroma. These exercises are extended beyond the classroom to the kitchen, garden and nature walks. The children are blindfolded and asked to identify flowers, spices and so on by their aromas. The materials inside the smelling jars are varied every few weeks to give the child an ever-changing challenge. The Sound Boxes are designed to begin the process of teaching the child to listen attentively. It consists of a set of twelve hollow wooden cylinders, six of each has red caps and six of which has blue. Each set of six appears identical except for the color of its cap. Inside each set, six different substances (such as sand, dry rice or dried peas) create distinct sounds when the cylinder is shaken. The child arranges the cylinders into two sets according to the color of their caps and attempts to match the identical pairs by sound alone. Once the children can accomplish this, they learn to grade them from the softest to loudest sound. The Montessori Bells extend the child's ability to distinguish sounds into each area of musical pitch. They are a lovely set of bells fixed to a wooden base. Each bell is tuned to either a whole or a half note on the standard musical scale. The entire set comprises one entire octave, including sharps and flats. The set includes one set of bells with tan bases for both half and whole notes and a second set in which the bases of the bells that sound the whole notes are painted white and those for the sharps and flats are painted black. At first children learn how to strike the bells with a small mallet to produce a clear note and damp them with a little felt covered rod. Then the teacher sets out two or three pairs of bells from the tow sets. The children match the pairs that produce identical notes. When they can do this easily, additional pairs are added until they can match the entire sets. A more difficult exercise challenges the children to grade the bells of just one set by pitch, from the lowest to highest notes. As they become more familiar with the bells, children will commonly learn how to play and compose little melodies. The Silence Game helps the children develop a much higher level of self-discipline, along with a greater awareness of the sounds around us that most people take for granted. In this group activity, the teacher will get the children’s attention either by ringing a small bell or by hanging up a sign with the command "Silence". The children stop where they are or gather on the line, close their eyes and try to remain perfectly still. The children sit still with their eyes shut and wait to hear the teacher whisper their name. When they hear it softly spoken, they silently rise and join together. Sometimes the teachers will vary the Silence Game by challenging the children to carry bells across the room without allowing them to ring or they may use the calm atmosphere to introduce the children to guided visualization. At first younger children may not be able to hold the silence for more than 20 or 30 seconds, but gradually their ability to relax, listen and appreciate the perfectly calm environment increases. In many classes the Silence Game is an important daily ritual. The Geometrical Cabinet is essentially a set of puzzles made in the shapes of the essential plane geometric figures. It consists of six drawers, each of which is fitted with several wooden frames inset with a geometric form. In addition to the familiar circle, square and rectangle, the child is introduced to a much broader array of complex figures, from the right scalene triangle to the decagon; and from the ellipse to the curvilinear triangle through the quatrefoil. In addition to removing the puzzle pieces and replacing them in their frames as a puzzle, the children learn how to match them against three sets of printed cards that represent the same figures in increasing degrees of abstraction. The first set represents each shape completely colored in on the card in the same size as the piece from the cabinet. The children simply cover each card with the matching puzzle piece. In the second set, the geometric shapes are printed as outlines drawn with broad lines that leave the inner area white. In the third set, the figures are simply traced with thin lines. As the children gradually begin to recognize the more abstract representations of the three-dimensional objects, they are preparing themselves to recognize the little lines and squiggles of the written word. Gradually, children learn the names of each of the geometric shapes. Once the children begin to read and can verbally identify the shapes, they will begin to label them with pre-printed name cards. Eventually the children will be able to prepare their own cards from scratch. The Geometric Solids - the logical extension of the Geometrical Cabinet is the set of Geometric Solids. The children learn the names of these wooden forms, identifying them first by sight and eventually when blindfolded. The set includes a sphere, cube, rectangular prism, a pyramid, triangular prism, ovoid, ellipsoid and a cone. The children quickly begin to look for each geometric form in their environment. They also begin to discover the relationship between the two-dimensional figures and the solid forms: a circle is related to a sphere, a square to a cube etc. As they begin to read, children will learn to match geometric solids to a set of prepared label cards. Eventually, they will be able to prepare their own from scratch. This early introduction to Geometry continues in the Elementary Montessori program. After years of hands-on experience with geometric figures, children normally find it very easy to grasp more advanced concepts, from the definitions of geometric terms to the calculation of area, volume and circumference. The Constructive Triangles allow the children to explore the geometric possibilities inherent within several types of triangles. The material consists of six boxes, each of which contains a set of brightly colored flat wooden triangles, which can be manipulated like a puzzle to form new geometric shapes. For example, two right triangles inverted and joined together along the hypotenuse form a rectangle. To help the young child recognize the essential relationships, most of the triangles have line drawn along those edges that join together with other triangles with a side of the same length to form new figures such as rectangles, squares, trapezoids and polygons. The Binomial and Trinomial Cubes are the most fascinating materials in the Montessori curriculum. At one level they are simply a complex puzzle in which the child is challenged to rebuild the cubes and rectangular prisms contained in the box back into the form of a larger cube. Color coding on the outside of the box and the sides of certain pieces helps the child detects the pattern. The material is also an exercise in algebra and geometry, representing in concrete form the cubes of a binomial and a trinomial where a = 2 cm, b = 3 cm and c = 4 cm. The process of learning how to read should be as painless and simple as learning how to speak. Montessori begins by placing the youngest students in classes where the older students are already reading. All children want to "do what the big children can do", and the intriguing works that absorbs the older students involves reading; there is a natural lure for the young child. Montessori teaches basic skills phonetically, encouraging children to compose their own stories using the Movable Alphabet. Reading skills normally develop so smoothly in Montessori classrooms that students tend to exhibit a sudden "explosion into reading", which leaved the children and their families beaming with pride. The Sandpaper Letters are a set of prepared wooden tablets in which each letter is printed in white sandpaper, glued down against a smooth colored background. Dr. Montessori's research confirmed what observant parents have always known: children learn best by touch and manipulation, not by repeating what they are told. Her manipulative approach to teaching children to read phonetically is nothing short of simple brilliance and should have long ago become a basic element is every Early Childhood classroom around the world. Beginning at age two or three, Montessori children are introduced to a few letters at a time until they have mastered the entire alphabet. They trace each letter as it would be written, using two fingers of their dominant hand. As they trace the letter’s shape, they receive three distinct impressions: they see the shape of the letter, they feel its shape and how it is written and they hear the teacher pronounce its sound. The teacher and child will begin to think up words that begin with this sound: kuh (=c) - cat, candle, can and cap. Seeing the tablets for the letters c, a, and t laid out before them, the children will pronounce each in turn: kuh, aah, tuh: cat! To help children distinguish between them, consonants are reprinted against pink background and vowels against blue. Many parents find it curious, that Montessori children are not taught the names of letters; instead they learn the sound that we pronounce as we phonetically sound out words, one letter at a time. For a long time, children may not know the names of letters at all, but will call them by the sounds: buh, cuh, aah etc. This eliminates one of the most unnecessary and confusing steps in learning to read: the letter "A" stands for apple. The sound it makes is "aah". Many Montessori classrooms use Sandpaper Letters that do not follow the traditional circle and line approach of teaching a young child to teach. Both cursive alphabets and D-Nelian letters (a modified form of italic printing that facilitates the jump to cursive) are available and used with excellent results. Another unusual result of the Montessori approach is that young children will often be able to write (encoding language by spelling phonetic words out one sound at a time), weeks or months before they will be able to comfortably read (decoding printed words). The Movable Alphabet - once the children have begun to recognize several letters and their sounds with the Sandpaper letters, they are introduced to the Movable Alphabet, a large box with compartments containing plastic letters, organized much like an old-fashioned printer's box of metal type. The children compose words by selecting a small object or picture and laying out the word one letter at a time. As with the Sandpaper Letters, they sound out words one letter at a time, selecting the letters that make that sound. The phonetic approach, which has mysteriously fallen out in many schools has long been recognized by educators as the single most effective way to teach children how to read and write. However, we have to remember that, unlike Italian and Spanish, English is not a completely phonetic language. Just consider the several different sounds made by the letters "ough". There is the sound "off" as in "cough", or "uff" as in "rough" or "enough", or the sound "oooh" as in the word "though", or the sound "ott" as in "thought". Altogether, there are 96 different phonograms (combinations of letters that form distinct sounds) in the English language. (such as ph-, -ee, ai, oo, etc.). It is not surprising that in the early years, as young children are beginning to compose words, phrases, sentences and stories their spelling can sometimes get a bit creative. For example, the word "phone" is frequently spelled "fon". Montessori teachers deliberately avoid correcting children's spelling during these early years, preferring to encourage them to become more confident in their ability to sound word out rather than risk that they will shut down from frequent correction. The process of composing words with the Movable Alphabet continues for many years, gradually moving from three-letter words to four- and five-letter words with consonant blends (fl, tr, st etc.) double vowels (oo, ee etc.) silent e's and so on. The Metal Insets - First Steps to Writing. Dr. Montessori found, that children in her schools were capable of encoding words months before they developed the eye-hand coordination needed to control a pencil. By using specially prepared movable alphabets, Montessori separated the process of beginning to write from its dependency on the child's ability to write with paper and pencil. To help children develop the eye-hand coordination needed to grasp and write correctly with a pencil; Dr. Montessori introduced them to a set of metal frames and insets made in the form of geometric shapes. When the geometric inset is removed, the children trace the figure left within the frame onto a sheet of paper. Then they use colored pencils to shade in the outline they have traced, using careful horizontal strokes. Gradually children become more skilled at keeping the strokes even and staying within the lines. As they get older, children begin to superimpose several insets over each other, creating complex designs which, when colored in, resemble stained glass. Montessori children will often prepare beautiful little books of their Metal Inset work. Early Reading Exercises - As children learn to work with the Sandpaper Letters, the teachers will lead them through a wide range of pre-reading exercises designed to help them recognize the beginning and later the ending and middle sounds in short phonetic words. One common example would be a basket containing three Sandpaper Letters, such as c, b and f. In addition, the basket will contain small dime-store objects that are models of things being these letters. The basket described above might contain little objects representing a cat, cat, bug, bag, bat, flag, frog, and fan. Other exercises will substitute little cards with pictures instead of the small objects. Cards with the names of familiar objects are commonly found in most kindergartens. However in Montessori, children take this a bit further, learning the names of and placing the appropriate labels on a bewildering array of geometric shapes, leaf forms, the parts of flowers, countries of the world, land and water forms and much, much more. Montessori children are known for their incredible vocabularies. Where else would you find four year olds who can identify an isosceles triangle, rectangular prism, the stamen of a flower or Asia? When Will Children Start To Read? There is typically a quick jump from reading and writing single words to sentences and stories. For some children, this "explosion into reading" will happen when they are four; for others when they are five and some will start to read at six. A few will read even earlier, and some others will take even longer. Most will be reading very comfortably when they enter first grade, but children are different and as with every other developmental milestone, it is useless to fret. Again, the children are surrounded by older children who can read and the most intriguing things to do in the classroom depend on one’s ability to read. This creates a natural interest and desire to catch up to the big friends and join the ranks of readers. As soon as children, no matter how young they are, show the slightest interest, we begin to teach them how to read. And when they are ready, the children pull it all together and are able to read and write on their own. Command Cards are used with older children to suggest specific challenges in every area of the curriculum. For example, in Geography, a command card might challenge the child to look in the atlas and find the location of the largest inland lake on the Earth. Teaching Children the Consonant Blends and Phonograms of the English Language - Montessori uses two sets of small Movable Alphabets, each made off a different color, to help the children master consonant blends, such as fl, st, ch, cl, cr, or tr. A consonant blend requires the child to blend two distinct letter sounds together into one, as we do when we say "flag" or "train". The child lays out several copies of the consonant blend with one color of the Movable Alphabet. Then the child completes the small words by adding the remaining letters in the Movable Alphabet printed in the second color. An example might be tr..ip, tr..ade, tr..ain etc. Phonograms are combinations of vowels in the English Language that form new sounds on their own, such as ee, ai, oa, and ou. Some phonograms, such as "ough", can make more than one sound. For example, ough has one sound in "cough", another in "although" and still another in "through". The children construct words containing phonograms using two Movable Alphabets just as they do with the consonant blends. Montessori teachers will normally prepare little booklets, each of which contains many examples of one particular consonant blend or phonogram. Puzzle Words - some words, most of which have come to English from other languages, just don't follow the familiar rules. Examples of Puzzle words are: the, was, you, they and their. They have to be learned by memory. The Study of Grammar and Sentence Analysis - We begin to teach the functions of grammar and sentence structure to students as young as age five and six, just as they are first learning how to put words together to express themselves. This leads them to master these vital skills. Before long, they learn to write naturally and well. Dr. Montessori created a set of symbols to represent each part of the speech, which helps the children learn easily during a time in their lives when it is a delight rather than a chore. For example, the symbol for a noun is a large black triangle. Because they are related to the "noun family" the symbols for an article and an adjective are also triangles. To distinguish them from the noun, which they modify, the symbol for an adjective is a dark blue triangle about one-third smaller than the larger symbol for the noun and the symbol for an article is a much smaller light blue triangle. The children will often call the noun a "naming word", an adjective a "describing word", a verb a "doing word", and so on. By the way, the symbol for a verb is a large red circle (implying a ball, or movement, since verbs describe action), and the symbol for an adverb is a smaller orange circle, showing that it is related to the verb. Literature and Research - At this point, we begin a systematic study of the English language: vocabulary, spelling rules and linguistics. The key to the Montessori Language Arts curriculum is the quality of the material children are given to read. Instead of insipid basal readers, even very young students are introduced to first-rate children's literature and fascinating reference material on science, history, geography and the arts. Students who learn math by rote often have no real understanding of ability to put their skills to use in everyday life. Learning comes much more easily whey they work with concrete educational materials that graphically show what is taking place in a given mathematical process. Montessori students use hands-on learning materials that make abstract concepts clear and concrete. They can literally see and explore what is going on. This approach to teaching Mathematics based on the research of Dr. Maria Montessori, offers a clear and logical strategy for helping students understand and develop a sound foundation in mathematics and geometry. The Montessori Math curriculum is based on the European tradition of "Unified Math", which has only recently been recognized by American educators. Unified Math introduces Elementary students to the study of fundamental of algebra, geometry, logic and statistics along with the principles of arithmetic. This study continues over the years, weaving together subjects that traditional schools normally ignore until the Secondary grades. In operations concerned with measurement, geometry shows them how to perform their calculations. In operations concerned with figures, algebra gives a system of still more abstract symbols by means of which more complicated relationships can be comprehended. The calculations of area and volume, square roots are examples in which algebra, arithmetic and geometry are involved. For Montessori students, arithmetic, algebra and plane and solid geometry have never been arbitrarily separated. Four- and five-year old Montessori children can name geometric forms that most adults would not recognize. The Number Rods are the child's introduction to Mathematics. These rods have the same dimensions as the Red Rods found in the Sensorial area. Here, however, the rods are painted in alternating patterns of red and blue to distinguish their length in segments of one-tenth of a meter (a decimeter). The first rod is one decimeter long and is just painted red. The second is two decimeters long and is divided into two segments, one red and one blue. This continues through all ten rods. As with the Red Rods, the children arrange the Number Rods into a stair from the smallest to the largest. Then they count each, alternating colored segments. One of the insights that children gain from working with the rods is the nature of addition and the concept that two numbers can add up to another. For example, when the children place the "one" number rod at the end of the "two" number rod, they create a new rod that is the same length as the "three" rod just above. They explore similar relationships with all of the number from one to ten. For example they discover that the "four" and "six" together are the same length as the "ten". The Sandpaper Numerals are used to label each Number Rod. These tablets are designed and used in the same way as the section on Language Arts above. The Spindle Boxes provide a nicely structured way for young children to make the next step in coming to understand the concepts of number and quantity. The material is made up of two wooden boxes, which together are divided into 10 compartments. The compartments are labeled with the numerals from 0 through 9. In a separate box or boxes the spindles are placed for counting. The exercise calls for the child to count the correct number of spindles to go in each compartment: one, two, three ...all the way to nine. Naturally the compartment "0" is left empty, teaching the child at a very early age the concept of zero as and empty set. If the child has counted correctly, there will not be any spindles left over when the child fills up the compartment labeled "9". The Number Cards and Counters - After considerable experience with the more structured introductions to number and quantity created by the Number Rods and the Spindle Boxes, the child is finally ready to tackle the task of associating cards on which the numerals have been printed and objects to count. The child begins by arranging the numeral cards in order from 1 to 10. Then the child begins to count out the appropriate number of counters, placing them in parallel rows of two after the number one. Even numbers end with an even number of counters in the bottom row; odd numbers only have one. This begins to focus the child's attention on the concept of odd and even numbers. The Golden Beads - An Introduction to the Decimal System - Dr. Montessori developed a wonderful educational material called the Golden Beads to illustrate concretely the nature of the Decimal System and its basic operations. The name comes from the beautiful color used for the finish on this set of one-centimeter diameter glass beads. A single bead by itself represents a unit of 1. Thus, 5 would represent by a collection of five "unit" beads. Ten "unit" beads strung together on a length of wire represents a unit of 10. Three "ten" bars together actually consists of 30 "unit" beads, or 3 "tens". The children quickly discover that 10 "unit" beads are exactly the same as 1 "ten" bar. They also begin to count not only the individual "unit" beads but by units of ten: 10, 20, 30... 00. Ten "ten" bead bars naturally equal the quantity of 100. Units of 100 are made-up of 10 "ten" bead bars laid by side and wired together to form a square. Ten "hundred" squares stacked one on top of the other form a cube containing 1,000 "unit" beads. They are permanently wired together to form the thousand cube. Using these concrete material even very young children can build and work with great number. In a typical early lesson with the Golden Beads, the teacher might challenge the child to "Bring me 3 thousands, 5 hundreds, 6 tens and 1 unit". While they will also work with prepared problem cards, children often enjoy thinking up numbers for themselves. The Number Cards - This special set of number cards is used to help the children learn numbers up to 9,999. Used to label the units, tens, hundreds and thousands columns in which the Golden Beads are laid out, they help children begin to understand the concept of hierarchy of the decimal quantities and how we borrow and exchange from the next column in Mathematics operations. Notice how the size of the cards and the color-coding to represent units, tens and thousands makes it easy for children to understand how large quantities are written left to right and worked with in vertical columns. The Bank Game: The Bank is the name give to a collection of Golden Bead materials, which includes enough "units", "ten" bars, "hundred" squares, and "thousand' cubes to allow several children to create large numbers. In one of the first exercises, the children explore the equivalencies of the decimal system. They learn that 10 "units" can be exchanged at the bank for a "ten" bar and that a "ten" bar can be exchanged for 10 "units". They also find that 10 "tens" can be exchanged for a "hundred" square, 10 "hundreds" for 1 "thousand" and that each can in turn be broken down into its equivalent in smaller quantity. Using the Golden Bead material, the children can build two or more large numbers and add them together. By going through the steps of addition in this very concrete manner, the children have a clear impression about what addition means. They also come to understand the process of exchanging, as they count the new quantities in each of the columns and trade in groups of 10 "units" for 1 "ten" bar, which they place in "tens" columns: 10 "ten" bars for 1 "hundred" and 10 "hundreds" for 1 "thousand". Once they understand how to add with the Golden Beads, Montessori children begin to use them to multiply, subtract and divide. The Short Bead Stair: Using the Golden Bead material, the child sees the numbers1 through 9 represented as individual units. But, as we mentioned above, although the child can count the beads one at a time, it takes many years before most children can recognize and really understand the idea of numbers greater than 3 except by one-to-one correspondence. To help the child truly begin to grasp the idea of quantities from 2 though 9, Dr. Montessori prepared a set of colored glass beads, 1 centimeter in diameter, in which each quantity is represented by the appropriate number of individual beads wired together as a bar with a specific, easily recognizable color. In this material the "1" is represented by a single red bead. The "2" by 2 green beads strung together, the "3" by three pink beads and so on up through the 10 Golden Beads that represent a unit of 10. The children work with the Short Bead Stair for many years, using the material to add and subtract exchange, borrow, explore multiples and for many other arithmetic processes. The Teens and Tens Boards: This material is made up of two different sets of boards, used by the child to explore the nature of quantities and numbers greater than nine. Each set consists of two boards, which are laid in a vertical row. The two boards are divided into nine sections, each of which is fitted with a thin frame into which the children can slide wooden cards on which the number 1 through 9 have been printed. Numbers have also been printed on the surface to the board, spaced so that when the cards are slid into the frame they will cover up one of the two digits. On the Teen Boards, the number 10 is printed in the nine spaced created by the frames. The children arrange the number cards from 1 to 9 in order and slide them into the frames, creating the numbers 11, 12, 13 ... and so on through 19. Using the Ten Bead Bar and the Short Bead Stair material described above, the children lay out the numbers 11 through 19 concretely. On the Tens Boards, the numbers 10, 20, 30, 40 through 90 are printed in the nine spaces created by the frames. They use the individual number cards to form numbers in the tens, such as 53, 24, and 79 etc. and use the Golden Bead "tens" and "unit" beads or Short Bead Stair to build their concrete representation along side. The Hundred Board challenges the young child who can count aloud from 1 to 100 to lay out the numerals in the same sequence. The Board is a square divided into 10 rows with 10 small squares along each row. The children work with a set of 100 wooden tiles that are labeled from 1 through 100. They spread them out on the rug, arrange them in numerical order and place them, one tile at a time on the Hundred Board, working from the upper-left hand corner along each row to the right, down to the next row and so on until complete. When they are comfortable with this, they attempt the same exercise by filling in the squares on a blank chart drawn to duplicate the surface of the Hundred Board. The Hundred and Thousand Chain: Another way the children practice their counting and develop an increasingly clear concept of the size of a "hundred" and a "thousand" is by working with the chains. These are long chains created by connecting 10 "ten" bars together to form a chain 100 beads long, or in the case of the Thousand Chain, by connecting 100 "ten" bars together to form a chain of 1,000. The children lay the chains out, duplicating them by creating a second line of individual “ten” bars. At the far end, they place the "hundred" square or "thousand" cube, as appropriate. When working with the Thousand Chain, they also set out "hundred" squares after every 10"ten" bars along the chain, representing that the next 100 has been crossed. In another exercise, they work with the number cards printed with the numbers 1 to 100 or 1 to 1,000 counting by tens. The children sort them in order and place them along the chain. They tend to be quite impressed when they first see the Thousand Chain laid out across the classroom floor. The Squaring and Cubing Material: Following the same concept, the Squaring and Cubing Material introduces the child to the concept of skip counting by one's, two's etc. through ten's. Each chain is constructed by connecting multiples of the Short Bead Stair, using the same color scheme that the children learned before; red "units", green "two" bead bars, pink "three" bead bars, etc. The material also introduces the children to the concept of the squares and cubes of the numbers 1 through 10. There are two chains for each number: one set representing the squares of the numbers 1 through 10 and the other representing the cubes. Thus, the square of 5 is shown as a chain of "five" bead bars (the square of 5 = 25) and the cube as a chain of 25 "five" bead bars (5 cubed = 125). The material also includes a set of bead bars connected to show the squares and the cubes of the numbers as actual squares and cubes. The children use the bead chains to skip count, working with number arrows similar to those use with the Hundreds and Thousand Chains. The Fraction Material: As the children become more and more comfortable with the Golden Beads, they eventually begin to ask whether there is anything smaller that the unit. The Fraction Skittles introduce children to the concept of a quarter, half and whole. The Fraction Circles take this concept much further. It is a set of 10 metal frames into which are set 10 circles one left intact, one divided into two parts, another into third's, fourth's fifth's through tenth's. The children learn the terminology, how to write fractions as figures and begin to explore first concepts of equivalence (2/4 = 1/2) and basic operations with fractions. The Stamp Game represents the first step on the Second Plane of Abstraction in the Montessori Math Curriculum. Where, in First Plane, the Golden Beads and Colored Bead Bars concretely represented quantities as three-dimensional objects, the materials used in the Second Plane are much more abstract. At this level they are essentially tokens, symbolic counters identical in size and differing only in color and in how they are labeled, but which represent different quantities. The Stamp Game is a box containing little wooden/plastic tiles (originally Dr. Montessori used paper squares that looked like postage stamps). Some are colored green and labeled "1" to show that they are units. Some are colored blue and labeled "10" to show that each represents a set of ten units. Some are colored red and labeled "100" and the last set is colored green and labeled "1000" to show that each represents a unit of 1,000. The children use the Stamps just like they did the Golden Beads, laying out quantities using the symbolic tokens to add, subtract, multiply and divide. By this level, the children are normally writing their work on paper and using the Stamps to help them visualize the process. For example, to subtract 822 from 1,000, the child would create four rows of stamps, beginning on the left with the "thousand", then the "hundreds". The "tens" and the "units" into the top row the child would place a single "thousand" column. Below, she would place nothing in the "thousand" column, 8 "hundreds" stamps in the "hundred" column, 2"ten" stamps in the "tens" column. Beginning with the "units", the child seeks to take two stamps away from the quantity above. Since the column is empty, the child turns to the row to the left (the "tens"), which is also empty. Eventually he finds that his only choice is to exchange the 1 "thousand" stamp for 10 'hundreds" which he places "tens" columns. Now he exchanges one of the hundreds for 10 "tens", which the child places in the "tens" column. Finally, the child is ready to borrow from the "tens" column to solve his problem. The child exchanges 1 "ten" from the "tens" column and exchanges it for 10 "units" and places them in the "units" column in the top row. From his top row contains the correct answer: 0 "thousands", 1 "hundreds", 6 "tens", and 8 "units" (1,000 - 822 = 178). The Multiplication Board offers another pathway to abstraction with this operation. In the Multiplication Board, the child lays out individual unit beads on a board organized into nine rows of nine shallow holes. The child lays out the beads in rows, for example 4 x 8 would be four rows of eight rows of eight beads per row. The Division Board is similar, except that here each vertical column of shallow holes represents one equal share, where a quantity is divided into two or more groups. The child places one small skittle at the top of each column to mark the number of shares that will be in her divisor; to divide 24 by 6, he begins by placing six skittles along the top. Then he counts out the number of beads that he wants to divide and begins to distribute them, placing one bead in each hole from the top left to right and then down a row, until he finally has shared her quantity equally among the vertical columns. Any beads left over are his "remainder." The Passage to Abstraction: By this stage the children are recording their work on paper, although many won't be able to solve the same problems if asked to, with paper and pencil alone without the visual aid of the Montessori materials. You have to remember that most young children under the age of seven or eight find it difficult, if not impossible to grasp something as abstract as quantities above three and what's really happening when we add, subtract multiply or divide. The concrete Montessori materials help the child to see and understand, slowly internalizing each concept until it becomes fixed and clear in his mind. Naturally children can't depend on the materials forever. Can you see your child at 16 walking in to take the SATs carrying the Golden Beads? Dr. Montessori compared them to an airport runway, which provides a smooth surface on which the plane can roll faster and faster until it is built up enough to speed to fly. The entire purpose of the Montessori Math curriculum is to make the abstract concrete, until the child can close the eyes and visualize mathematical process at work. Step by step, the materials become less concrete and more symbolic. Step by step, the child is challenged to demonstrate his understanding by teaching what he has learned to younger children, which also tends to reinforce and clarify the tutor's grasp of the subjects. Montessori uses a wide range of parallel materials and exercises to help the child extend his knowledge and gradually memorize the basic math facts that every one of us is expected to know. As parents, you will eventually begin to hear about materials with odd names like Snake Game, the Addition and Subtraction Strip Boards and the Negative Snake Game. Space doesn't allow us to describe every one of the Montessori Math materials, but your child would probably be delighted to introduce them to you. Memorization Charts: There are also an involved series of Memorization Charts and associated exercises that help the children in their final stages of mastering the addition, subtraction, multiplication and division charts. When the children have begun to show that they are ready for still more abstract exercises, they are introduced to another series of Math materials at the Second Plane of Abstraction. For example The Bead Frames (or abacus) challenge the child to solve problems in a slightly more abstract process. The Short Bead Frames allows the child to work with quantities up to 9,999. The Long Bead Frame uses quantities as large as 9,999,999. We are all members of the human family. Our roots lie in the distant past and history is the story of our common heritage. Without a strong sense of history, we cannot begin to know who we are as individuals today. Our goal is to develop a global perspective and the study of history and world cultures form the cornerstone of the Montessori curriculum. With this goal in mind, Montessori teaches history and world cultures starting as early as age three. The youngest students work with specially designed maps and begin to learn the names of the world's continents and countries. Physical geography begins in the first grade with a study of the formation of the Earth, the emergence of the oceans and atmosphere and the evolution of life. Students learn about the world's rivers, lakes, deserts, mountain ranges and natural resources. Elementary students begin to study world cultures in greater depth: the customs, housing, diet, government, industry, the arts, history and dress. They learn to treasure the richness of their own cultural heritage and those of their friends. The children also study the emergence of human beings during the old and new stone ages, the development of the first civilizations and the universal needs common to all humanity. For older Elementary students, the focus is respectively on early man, ancient civilizations and early American history. As part of the integral studies program, most Montessori Schools introduce a second language to even their youngest children. The primary goal in a Foreign Language program is to develop conversational skills along with a deepening appreciation for the culture of the second language. Science is an integral element of the Montessori curriculum. Among other things, it represents a way of life: a clear thinking to gathering information and problem solving. The scope of the Montessori science curriculum includes a sound introduction to botany, zoology, chemistry, physics, geology and astronomy. Montessori does not separate science from the big picture or the formation or our world. Students consider the formation of the universe, development of the planet Earth, the delicate relations between living things and their physical environment and the balance within the web of live. These great lessons integrate astronomy, the earth sciences and biology with history and geography. The Montessori approach to science cultivates children’s fascination with the universe and helps them develop a lifelong interest in observing nature and discovering more about the world in which they live. Children are encouraged to observe, analyze, measure, classify, experiment and predict and to do so with a sense of eager curiosity and wonder. In Montessori science lessons incorporate a balanced, hands-on approach. With encouragement and a solid foundation, even very young children are ready and anxious to investigate their world to wonder at the interdependence of living things, to explore the ways in which the physical universe works, and to project how it all may have come to be. For example in many Montessori schools, children in the early Elementary grades explore basic atomic theory and the process by which the heavier elements are fused out of hydrogen in the stars. Other students study advanced concepts in biology, including the systems by which scientists classify plants and animals. Some Elementary classes build scale models of the solar system that stretch out a half-mile! In Montessori schools, the Arts are normally integrated into the rest of the curriculum. They are modes of exploring and expanding lessons that have been introduced in Science, History, Geography, Language Arts and Mathematics. For example, students might make a replica of a Greek vase, study calligraphy and decorative writing, sculpt dinosaurs for science, create dioramas for history, construct geometric designs and solids for math and express their feelings about a musical composition through painting. Art and Music History and Appreciation are woven throughout the History and Geography curricula. Traditional folk arts are used to extend the curriculum as well. Students participate in singing, dancing and creative movement with teachers and music specialists. Students' dramatic productions make other times and cultures come alive. Montessori Schools are very interested in helping children develop control of their find and gross motor movements. For young children, programs will typically include dance, balance and coordination exercise, as well as the vigorous free play that is typical on any playground. With Elementary and older students, the ideal Montessori Health, Physical Education and Athletics program is typically very unlike that of the traditional model of "gym". It challenges each student and adult in the school community to develop a personal program of lifelong exercise, recreation and health management. Many schools have limited space and facilities, but where funds and facilities are available for older students, the ideal Montessori environment offers a variety of facilities and programs, which can potentially include a room with stationary bikes and other exercise equipment designed for children, an indoor track, a basketball court a room for aerobic dance and perhaps even an indoor pool and tennis courts. Again ideally, this fitness center would not be reserved for the children alone; school families would be able to use the facilities after hours, on weekends and during school hours when it didn't interfere with student programs. One important element in the Montessori approach to health and fitness is helping children to understand and appreciate how their bodies work and the care and feeding of a healthy human body. Students typically study diet and nutrition, hygiene, first aid response to illness and injury, stress management and peacefulness and mindfulness in their daily lives. Daily exercise is an important element of a lifelong program for personal health, but instead of one program for all, students are typically helped to explore many different alternatives. Students commonly learn and practice daily stretching and exercises for balance and flexibility. Some programs introduce students to yoga, tai chi, chi gon or aerobic dance. Children learn that cardiovascular exercise can come from vigorous walking, jogging, biking, rowing, aerobic dance etc. through actively playing field sports like soccer or from a wide range of other enjoyable activities such as swimming, golf or tennis. With older students, the goal is to expose skills and helping them to develop a personal program of daily exercise. We would like to express our thanks to the Montessori Foundation and Mr. Tim Seldin, President.